Managed to get a reasonable shot of 33415 in its new plain (bluish) white base livery for what I assume will be the full new First Group livery. We are still waiting to see what is happening with the PR1 as the bendy bus 10133 which was here was last reported as being in Bristol with rumours that the bendy buses had been rejected as unsuitable for the route. Several people suggest that these Enviros are on their way to Bristol, but again, until anything is confirmed I state that these are just rumours. 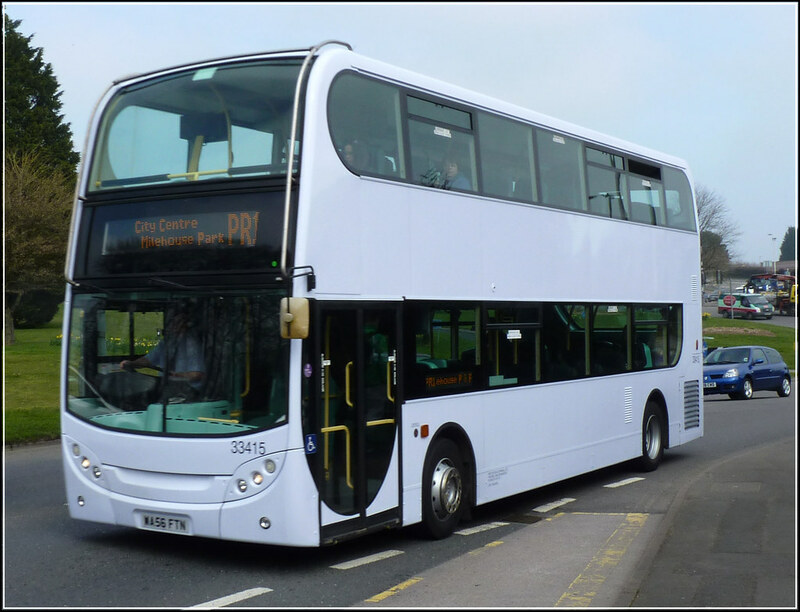 www.ensignbushire.com and click on the blog section you will see the latest post and whilst you are there you can have a look about the site. Looks good, will be interesting to see what eventually happens with the bendies/Enviros! This is certainly a hint that at least this bus is heading elsewhere; though it may be that the P&R enviros are losing their special P+R livery and being repainted, though I stress that literally came into my head when typing this, it's nothing to go on! There's loads of possibilities and rumours; it will be interesting to see the result! Oh NO, The re-painted Enviro has NOT been re-painted, The "Wrap" has been removed because the park and ride buses are being de-deliveried and going elsewhere, (Weston Super Mare) I have heard?? All park and ride buses will be replaced by older running stock. I can confirm that 10133 is in Bristol, it has been parked up in the same place for a while now. I can't think why the P&R Enviros would be going to Weston. Perhaps they are being re-painted in the new First livery since First are running the P&R commercially. First are replacing these with eight new Enviro 400s. 2 arrived in the depot this afternoon and the rest due down by next Tuesday. Seems strange to me but hey ho!